Have you ever wanted to build your own Homemade DIY DTG Printer A3 Version but didn’t know how to? Well, today we will have a look at our DIY DTG Project. This DIY DTG is capable of printing high-quality t-shirts like any commercial grade DTG printer. That’s because many DTG printers available on the market is actually an EPSON printer with just a custom housing case. 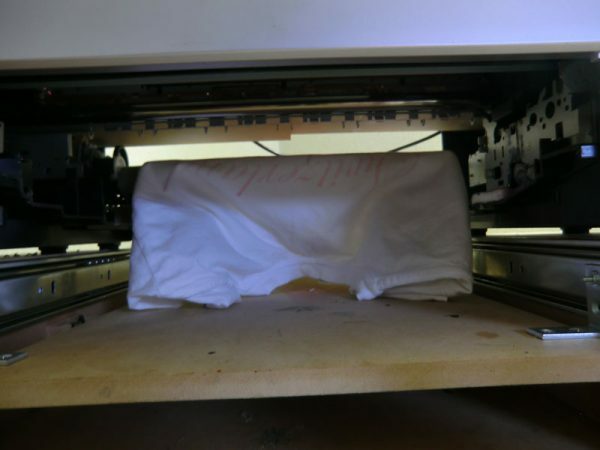 This printer can print on both black and white t-shirts with the help of a RIP Software. It may look hard to build your own DTG printer, but in fact, it’s a very easy and simple process. I have converted many printers into DTG before. But this A3 printer gave me the best result I could ever see. The other printers were all A4 based printers and did not have the same print quality as this one. I have built 2 DTG printer based on Epson T25, 2 x Epson C88 and now this one. Unfortunately, I never made any plans for the A4 printers. 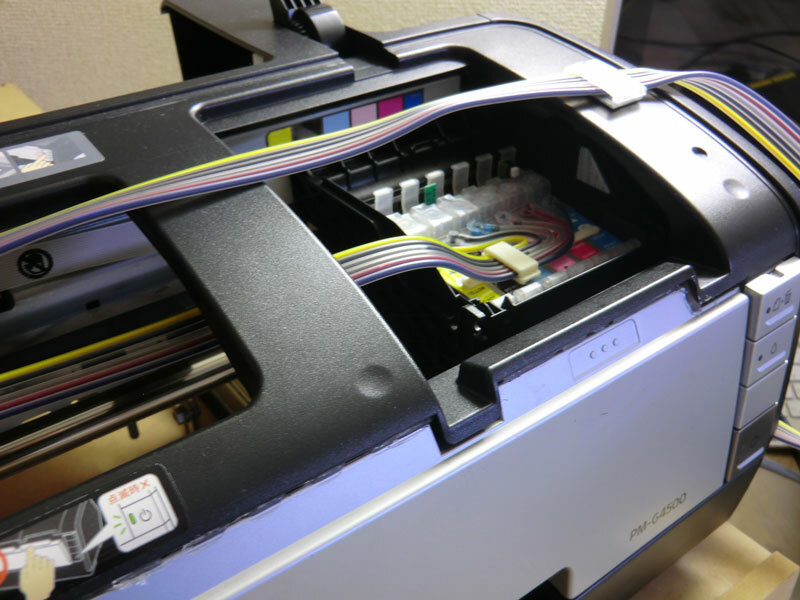 The Epson 1400 printer is excellent for DTG because it has 6 ink channels which means it has 4 CYMK and 2 additional inks for better performance, but I can swap the extra 2 ink channels and change to white cartridges so I can print on dark or colored garments. Please keep in mind that you must use some kind of RIP Software that allows you to print using only the selected cartridges if you want to print white ink. On this build I got the printer running using the original Epson driver but since this printer is programmed to use all the 6 cartridges to print I must use a RIP software. A RIP software is a program that allows you to change the way the printer works, it performs pretty excellent and I was able to get professional quality with a homemade DTG! The only way to print using only the CYMK cartridges is to use a RIP and for this build I got the EKprint Studio one of the best RIP available. The lever on the left side allows me to move the platen using an external power source and I can stop it on the position I want to. CISS (Continuous Inking System) this system allows you to refill the cartridges just by filling the tanks. Enough with pictures, lets watch the video you all wanting to see. And that’s my DTG printers! Guess how much the A3 DTG cost to make ? Hmm….To be honest it’s cheaper than the previous models! Here’s why: I bought it used for $36, but it’s was working in a good condition like new! I’m willing to help people build their DIY DTG printer too, so I have prepared an e-book plans located on the top of the post and on the bottom of this page, it’s compatible with many printer models as written in the e-book description. Most printers are the same usually the only difference is an upgrade in the print head or some extra features like Wi-Fi but the rest is usually the same as the previous models. Stock pigment ink is not suitable for printing on textile, it will stick to the garment and look nice before washing. A simple wash it will fade about 60% and trust me, there’s no way to make DIY Textile ink I already tried it with enamels, clear acrylic stuff and many other stuff, none worked. If your going to make T-shirt for selling you need Textile inks! On my case I found the DuPont Textile Ink pretty excellent for it, they’re around $30 per 125ML or 4oz. There many stores selling it, do a google search and see which company suits your needs. For DTG printing you will need a RIP software which allows you to take control over what your printer can do. I found that EPSON driver works good, but not enough to print on dark t-shirts or lay enough ink in each t-shirt. Pricing: this is a tricky question because it depends on your printer model and the deal you will get. I have seen people buy the license for as little as $30 on eBay. Note: I have been receiving lots of emails asking me how much it would cost to build one and ship it to their country, unfortunately I cannot build one but I made an E-BOOK teaching step by step how to build the printer base and how to adapt everything to it. Thank you for reading this post and have a good day, as I said I’m willing to help people with troubleshooting and errors.